1. 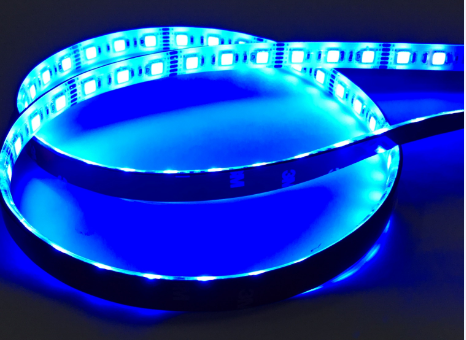 This 5050 blue led light strip uses 300pcs of 5050 super bright LEDs, which is 5m long. It can be cut into different lengths you need. 2. The LED Light strip uses 4 ounce copper PCB, which takes much strong current compared to regular 2 ounce copper or even worse ones in the market. It makes sure the product maintains long lifespan. 3. The LED light strip is fully coated, so it can be used outdoors. Our coating is environment friendly and endurable. For strips using bad coating, coating cracks easily, especially in winter time. 4. The LED Light strip is flexible and can be cut into different lengths, so it can be used anywhere you can think of. The PCB can be black or white. For some people who don't want the product to be visible, they can choose the suitable PCB color to blend well with the location where they install at.